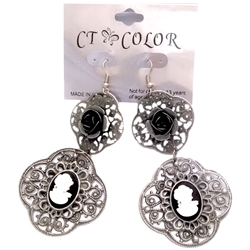 These cameo earrings compliment almost any upper class Edwardian or Victorian character including Gibson Girls. . It can be used in a number of different theatrical productions including Oliver or A Christmas Carol. These earrings require you to have pierced ears to wear.